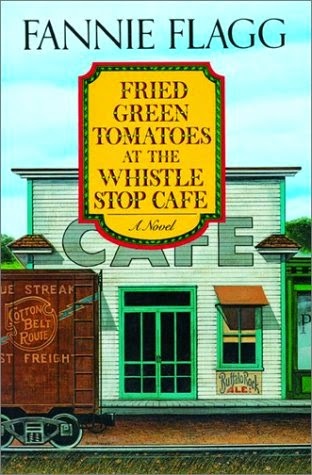 As I perused the Slumplist, I decided to look up a book that I have been meaning to read for ages but never had - Fried Green Tomatoes at the Whistlestop Cafe recommended by Ania. It's first the story of two women in the 1980s, of gray-headed Mrs. Threadgoode telling her life story to Evelyn, who is in the sad slump of middle age. The tale she tells is also of two women -- of the irrepressibly daredevilish tomboy Idgie and her friend Ruth, who back in the thirties ran a little place in Whistle Stop, Alabama, a Southern kind of Cafe Wobegon offering good barbecue and good coffee and all kinds of love and laughter, even an occasional murder. Erm I guess this section should more accurately be called the View from Page 81. I sort of just got lost and kept going. And I full blame the theme music playing in my head on that. The theme music from the movie from the early 90s. The theme music from one of my all time favorite movies. 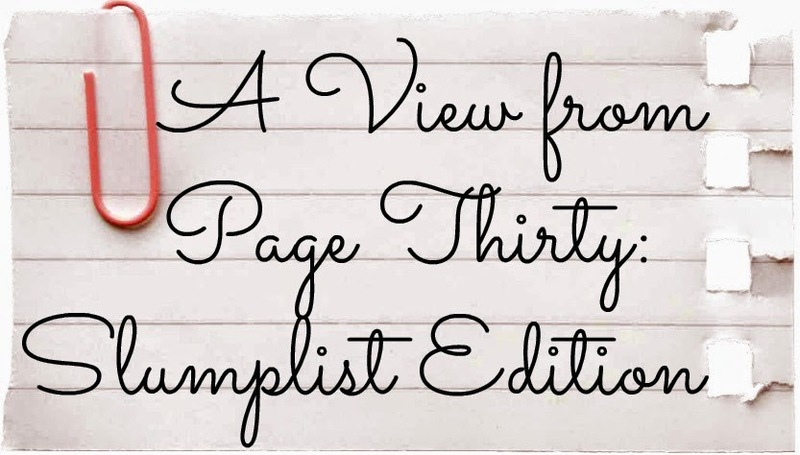 So knowing that background, I can't really say if this is a valid View from Page Thirty. I already pretty much know the story from the movie (at least I think I do), and I heartily love it to pieces. It brings ALL OF THE FEELS. I can't help but compare it to the movie and so far, I literally hear lines as I read them. I can't help but hear it narrated by Jessica Tandy. Personally I see this as a plus. Things are a bit more disjointed than the movie though. The movie, while keeping the flashback reveal that the book is doing, seems to focus more on the four main ladies, while this is almost the story of Whistlestop, Alabama. I am getting more information on the lives of some of the background characters in the movie, which I find quite charming. The order of things is all over the place though so I am not sure if people who don't already know the characters and the story like I do would enjoy it as much. But honestly I am still leaning towards the "Still enjoyable" camp. I was worried when I started this that all of the magic the movie has for me would be gone when reading the book because I know everything, but that's not the case. I am still loving the look at 1930s southern life. I am actually really looking forward to delve more into Ruth and Idgie's relationship and see how that compares with the screen. I am going to keep reading for sure, but I do think that when this is all through, me and my well watched DVD are going to curl up for another session of feels. So, is anyone else like me and avoiding reading a book a movie or tv show was based off of because you loved the adaptation so much? How about those that have taken the plunge, did it work out for the best or not so much? I often read books after seeing the movie, mostly because I don't realize that they started as books :) My most recent was Practical Magic by Alice Hoffman. I have seen the movie multiple times but still really enjoyed the book, which was very different than the movie. LOL, this book has been sitting on my shelf for years! And I grew up watching this movie. I'm really glad that you like it so far. I'm usually afraid that the movie ruins the book for me or that the movie doesn't do the book justice. I just finished read The Best Exotic Marigold Hotel. I was worried it would be too much like the movie but it was actually different enough that I wasn't sure what was going to happen next.